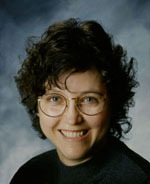 Author Melody Groves is a novelist and nonfiction writer whose freelance articles can be found in publications such as American Cowboy, Wild West, True West, and New Mexico Magazine. 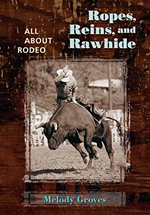 Her three nonfiction books cover historic bars of the Southwest, the ins and outs of rodeo, and America’s first overland mail route. She uses her passion for the Old West, along with experience as a gunfighter and a bull rider, to infuse her Western novels with authenticity. While hard at work on the next two installments of her light-hearted She was Sheriff series, she continues the Colton Brothers Saga with book five. 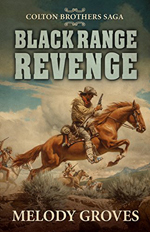 Her newest release, Black Range Revenge (Five Star Publishing, 2018), pits youngest brother Andy Colton and his siblings against an Apache leader bent on revenge. You’ll find Melody on her website MelodyGroves.net and on Facebook. The Colton Brothers Saga follows four brothers in their quests for a better life in the Old West. What was your favorite part of putting together Black Range Revenge? I don’t usually write paranormal, but the idea of a ghost, or spirit, excited me, so I put one in. I enjoyed highlighting the youngest brother, Andy. And I finally gave James some closure to his previous Apache captivity. How do you decide which brother to focus on in each book? Describe your main characters and what’s most important to each of them. While I try to give the brothers “equal time,” the character who steps forward first gets to tell his story. Hope that doesn’t sound too crazy. Trace is the oldest at 27, married, two little girls. Family is most important to him. James, four years younger than Trace, married, no kids, tends to be a bit unstable mentally. He is impatient, short-tempered and doesn’t think things through. Luke, two years younger than James, is the black sheep. A rabble-rouser and definitely a ladies’ man, got married and became a dad at 17. He still chases skirts and his morals are not those of the rest of the family. Andy, at 19 by the book’s end, is adventurous but a heckuva nice guy. He’s liked by everyone he meets. He’s probably the definition of innocent. All four boys are strong and not afraid of work. They have a strong sense of family entrenched by their folks. Which character did you love to torture the most, wished you could slap some sense into, or couldn’t wait to be done with? James immediately comes to mind. He doesn’t always think things through and tends to react which gets him in trouble. Of the four boys, he’s the most sensitive, which makes his torture by Cochise (in book 2) terrifying—for both of us. James has PTSD because of that experience. Sometimes I wanted to throttle him, at other times I wanted to tell him it would be okay. Trace handled his captivity much better. What unique challenges did this project pose for you? The area of New Mexico where the story takes place has changed over the past 150 years. The town of Santa Rita, which is in the book, is completely gone now. The town of Mogollon was just a single cabin in 1850 and maybe two cabins by 1863. I had to be sure the history was accurate. How long does it take you to put your novels together, including researching, writing, and editing? I’ve been up in the Black Range of New Mexico many times since I’m from Las Cruces and my parents and I used to camp in that area. So, I’ve sort of worked on the research for Black Range Revenge for several decades! As for writing, it takes me about nine months to finish a book, especially since I work on other projects along the way. My editor at Five Star Publishing works with me until it’s “perfect” which takes a couple of months. Then, when it’s polished, it goes through another editor before it’s scheduled for publication. This whole process takes about two years. Two loooonnnngggg years. Was there anything interesting you discovered while doing research for Black Range Revenge? I think the most interesting was realizing how many different groups of people have been up in that area—Anasazi, Apache, Mexican, miners, European immigrants, Americans, etc. The history is fascinating and reaches back at least 500 years. I’m thrilled to write about it. Of the three nonfiction books you’ve written, which one did you enjoy writing the most? Are you a pantser, a plotter, or a hybrid of both? What does a typical writing session look like for you? While I’m a pantser, my characters guide me. I do, however, take a page from another writer’s method and briefly (I mean briefly) describe what’s going to happen in the next few chapters. That has helped keep my characters and me somewhat guided. But I’m a firm believer in letting your characters “do their thing.” I’ve learned they are much more interesting than anything I can think up. As far as a writing session, I like to use mornings to write, then do research and everything else in the afternoon. I have my own office, which helps a lot. I also do tons of book reviews, so my day starts out with several cups of coffee (you see this theme in all of my books) and about an hour of reading a Western—certainly gets me in the Western mind-set. What do many beginning writers misunderstand about telling a story? That’s easy. That they’re TELLING a story, not educating nor preaching. If a reader learns something, fine. But our job is to spin a tale, put readers in a different place and time from their own. Entertain them. We are entertainers, storytellers, not priests or professors. 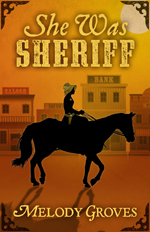 I’m about five chapters away from finishing Lady of the Law, the sequel to She Was Sheriff (Five Star Publishing, 2016). And I’m plotting the third book in that series. I have another novel at Five Star Publishing, and I expect to receive a list of first edits any day now. Big news—working on a graphic novel! It’s based on the book currently at Five Star. I found an amazing illustrator who lives in Phoenix. We’re both so excited about finishing our first graphic novel! I also write for magazines, so I’m working on those articles as well. And I’m having tons of fun researching a novel about my relatives emigrating from Ireland and landing in New Orleans. I’m a native New Mexican (there are so few of us! ), but graduated from high school in the Philippines at Subic Bay Naval Base during the height of the Viet Nam war (we were the closest ship repair facility). So, my high school experiences were way different from most people. I started writing Westerns when I was in junior high but was told “nobody reads those any more.” So I struggled with writing other things until I said the heck with that and wrote shoot ‘em ups. Well, Westerns today are quite popular—#2 in sales under graphic novels. Who knew? I write the traditional cowboy/barroom brawl story, which I love. I also love stories about family, in particular the relationship of brothers. I throw in enough history to make it historical fiction. One thing most people don’t know about me is that about ten years back I decided to become a bull rider. I went to a bull riding school in Colorado (twice) and learned how. Yes, got thrown off every time, but I’ve had the experience—and the bumps and bruises to show for it. If I were in my teens today, I’d be riding bulls every weekend. It was that awesome! I live my life knowing I faced fear and conquered it. Nothing compares to riding those one-ton bulls. Find out more about Melody and her writing in her 2016 interview for SouthWest Writers.